Going to publish a few tributes to past Martial Arts Instructors who’ve influenced who and how I am in Martial Arts. Some I’ve trained with for many years, some on and off, some for only a short while. With all the ones I mention I’ve learned something. Sometimes only one thing! But these are powerful lessons and lasting techniques, truths and ideals, that transformed me as a martial artist and even as a person. 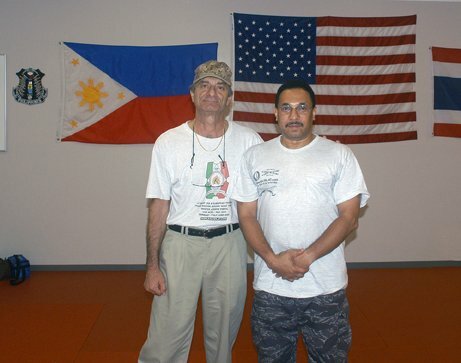 MasGuro Greg taught me a Filipino Martial Arts System he developed called SinaTirsiaWali Kali Silat. A man of wide ranging skills and an open and inviting personality, some call him a character, and he is that too. He is from the group of early students of Grand Tuhon Leo Gaje in Pekiti Tirsia. Some of his early classmates have quarrels with him, I don’t know the full stories but a little of it sounds political. However it is undeniable that he was a great influence early in promoting Filipino Martial Arts through the TV Program he produced in the 70’s, the video documentation he provided at events, and his own promotion of the arts.